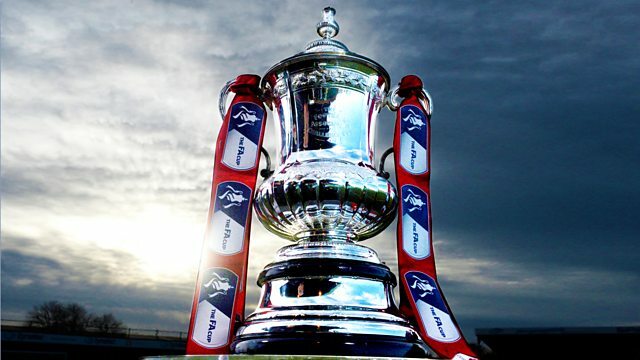 Live coverage of the FA Cup fifth-round game between Wigan Athletic and Manchester City. Browse content similar to Fifth Round: Wigan Athletic v Manchester City. Check below for episodes and series from the same categories and more! Wembley on the 11th of May, 2013.
the town, it became our motto. was novel, it was unique. this might be our day. in now, I'm heading to those steps. footballing day of your life? like double heart break I resume. something you were used to. belief and you can do it. Cook and this is his starting XI. part in a competitive game. much of a Philip is that? They have scored 111 goals so far. their stride. You never know. what we have to achieve. early on. What about that! keep that picture for over! look at yours as well! significantly in the glory days. it seems on course for promotion. couple of Wigan's key players. the game of their lives tonight. to get eventually where he is now. one who started the build-up. One of the great English teams. there is a time, it is now. match. How clever was that? about titles. The next one. Powell and Byrne, quality players. what can happen in this competition? they have done so far. I was not ready to play. mascot for that particular charity. Joseph is an inspiration in Wigan. the local reporter, isn't he? cannot win all four, will be? don't think they can, no. belief like around Manchester City? he plays, to win every competition. defend quick and really high up. tactic. A great range of passing. words that he didn't already know. him to settle into the English game. lot of great players. LeRoy saying. someone else, and he can do that. over the top he's lightning. will break any defensive system. saw Spurs yesterday make 11 changes. Pep just nudges it around. out will be a test for Wigan. these clubs very well indeed. he's been working for Wigan of late. What has been your role? on the front foot in this game. they believe? That's the question. concerned to get something today? think has got to have a good night. six in six in the FA Cup so far. Delph, Stones, Danilo and Laporte. of achieving their goal tonight? but it's how long they can do that. will be an interesting game. Pep likes his goalkeepers to be. Sergio Aguero seven yards from goal. get that one on target. things happen out of nothing. there is very fortunate I think. ten seasons including to Wigan. Wigan. David Silva here. Delph. most of the time. Fernandinho. brilliantly, no support at all. to Grigg seems to be a good option. Bravo. It is a Wigan throw. and Gundogan finding that witness. not quite get the contact. Delightful ball by David Silva. cannot lose. Here is Leroy Sane. Roberts did well. Here is Grigg. in his mind to get that shot off. the finest 13 minutes of his career. wobble. The goalkeeper did well. get on the end of his past. feel the football at their feet. again. Power, neatly done. Roberts. looking down the other flank. to get into the game. would have been expected to win. Conceding five goals in two games. him to exploit? A good block. the right decision not to give it. try to catch up Leroy Sane. Dealt with in the middle by Dunkley. away. Bernardo Silva ahead of him. Just forced to check his run. that Wigan need to be aware of. and this time again given away. He has been breaking from midfield. the team, very good on the ball. for him. A real shame. men at the minute. Powell back on. trying to close every angle. comes out that can break the chain. to check the run. David Silva. City. The first corner of the game. time. Manchester City, their corner. Gundogan, well could not control it. goalkeeper Walton is on loan from. get past Manchester United first. Manchester City will look to get in. lovely little run in. Danilo. and the other comes on to help. way over the bar in the end. his header, Laporte over the bar. the possession, that is expected. going to hit it. Deflected, corner. strike. Good block from Dunkley. space. Delph in a lot of space. take it, certainly. David Silva. Wigan Athletic. Offside. Leroy Sane. is going to be, with that scoreline. forward. Aguero, off to Gundogan. first half. Fernandinho was there. They're up to the job at the moment. But they have not broken through. the cross they were looking for. of quality in midfield from Perkins. striker, the ball being overhit. splendid hat, Joe Royle to his side. successive Cup finals in the 1980s. it very well, Byrne. Driven eight! the back of Wigan too often. but Wigan will take that. Dublin when they needed to. running across the line of the ball. when he has a head start. Swindon he really came to the fore. Aguero, lovely shake of the hips. favour his outside and it showed. straight towards goal. Leaves Byrne. and that was one of them. David Silva trying to get the flick. Manchester City reduced to ten men. had the yellow card in his hand. did, 100% he had the yellow card. interesting in that tunnel now. allow Manchester City to dictate. believe they can win the game. it was enough to be a red card. can't. I know he a bit high. linesman is giving him information. control really and he was reckless. they have attacked and done it well. third and attacked them very well. too hard and he looked at Danilo. Here it's an incredible opportunity. natural defenders, is it showing? back but he steps in far too early. For a second it is three versus two. causing problems into the back four. lovely pass to Guendogan again. with the two versus one situation. It is a very difficult thing to do. they will get punished for it. putting my money on Sergio Aguero. composure in and around the goal. will be a meeting of familiar foes. the majority at club level. have problems if you have that one! him a lot in midfield this season. ball, have a short pass, long pass. place to play, Manchester United. What does he give you? He has a little bit of everything. one of the nations needs to be out. is a margin for error. Manchester City were hoping for. challenge on one of their players. Silva took it away from him. Aguero. Dunkley fill that hole. ball and Wigan have the free kick. -- jump for the ball. Fulton. Stay alert to Aguero. of course came the red card. Byrne trying to run in behind. lose in the FA Cup. fallen he made a good impression. Danilo. Stones. Here is Walker. half. The shot hit Dunkley. Great noise from the visiting fans. problem for a Wigan with that pace. but could not direct it. Power away. Danilo put under pressure by Massey. midfielders it could be tough. Jacobs being chased by David Silva. ricochet did not favour Max Parrot. Walton in the Wigan goal. in Mexico at the end of his career. Massey. The yellow card is out. to show and it is. Delph shown a straight red card. either away or add a neutral venue. to Walker. Here is David Silva. box for city. Walker driven across. It is a Wigan throw. selection, Wigan playing a top side. Wigan. Cut out by David Silva. Wigan, at the top end of the pitch. in front. Walker, well blocked by L.
offside and I think he knew it. two midfielders are too high. Silva finding that pocket of space. The touch from Aguero let him down. That is dangerous. Bernardo Silva. none better than Kevin De Bruyne. for Kevin De Bruyne as he comes on. impact and they have got a corner. the goal on their feet. -- fans. problem, Wigan. Aguero into the box. Wigan. And can he run. forward but nowhere near Grigg. Fulton, trying to win the ball. A free kick to Manchester City. Kevin De Bruyne to take it. has come on. But defended well. Elder climbing. Grigg to Jacobs. Good strong challenge by Stones. ball got away from L. -- Elder. little less than 19 minutes. Kevin De Bruyne chased by Power. Nice little backheel from Guendogan. to stay on his feet. for the replay. Here is Walker. enough. Putting in so much effort. Wigan. Fulton with a clearance. Jacobs with nowhere to go. from midfield, they cannot stop him. Walker on the run. Hit Byrne. boot, I'm not sure. Time ticking by. far side anyway. What does delivery. nothing Bravo can do about that. Wigan through to the next round. was. He was under so much pressure. It was getting tighter and tighter. tie. Ten men, Manchester City. got some energy in their legs now. throw, came off Jacob's to. mistake that led to the goal. Bernardo Silva for Manchester City. to Danilo. Out by Dunkley. Great ball, Burn on the end of it. Fabulous control. It's a free kick. that the free kick has been given. make him take it again. he had blown his whistle. trouble Walton. Here is the moment. match is in the balance. everywhere. It is still in play. make the block. City throw. Time is against Manchester City. pulled. Here is Kevin De Bruyne. Kyle Walker... It's a corner. Silva did well. Here is Kyle Walker. Wigan Athletic. Aguero hobbles away. Man of the Match, Jermaine? for Wigan, he was there to deliver. game. They haven't lost it yet. been a big problem but it didn't. historic quadruple on the line here. over a century of goals this season. Wigan, they don't get it. the far post, fantastic header. There is more agony for Wigan yet. kick, they are not going to get it. past the four. It is Bernardo Silva. defending resolutely, I have to say. Having to deal with everything. that just might do it. sides we have ever seen in the land. as they were in 2013 in the final. dream of four is no more. FA Cup is theirs tonight. obviously it was a nice, easy game! No, we put in a great performance. got the warmth and that was enough. competitions, this is no mean feat. against Walker of all people. brilliant, it is such a severe test. the game played and correctly so. before half-time. Here it is. still think it was a yellow card. The referee takes his time. maybe he's changed his mind. depends on the angle of the referee. get back into the championship. atmosphere at the DW Stadium.